How is a wife to love her husband? By learning three things, says Tony Evans: how to submit, seduce, and surrender to her husband. Out of these three principles a godly marriage will grow. In For Married Women Only, pastor and author Tony Evans explores these three principles in a straight-forward yet encouraging manner. He unpacks the touchy topic of submission and lays out the rewards inherent in this biblical model. On seduction, Evans looks at the quality of attractiveness and how embodying it can be pleasing to your spouse and to God. And with surrender, readers will examine why a wife is the perfect help mate for her husband and how to combat attitudes opposed to God's design. Originally published in 2002 as Tony Evans Speaks Out on a Woman's Role in the Home, this booklet has sold nearly 38,000 copies. Use it alone or with the companion volume, For Married Men Only. 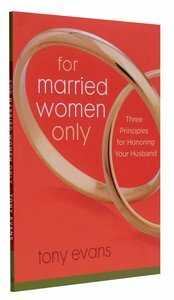 About "For Married Women Only: Three Principles For Honouring Your Husband"